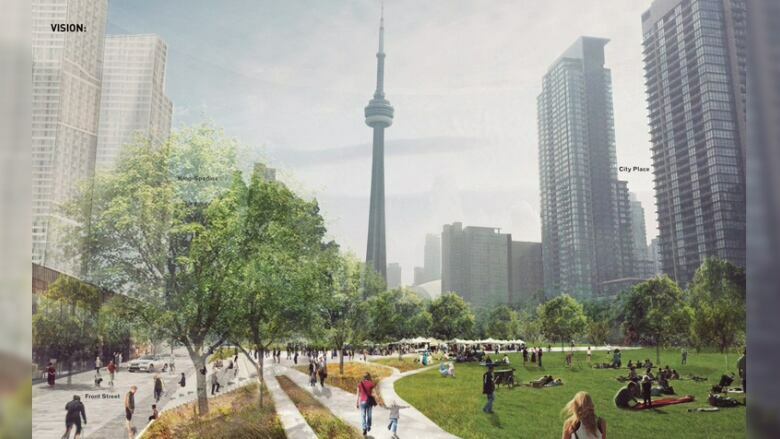 As Toronto puts together plans for a sweeping new park that would be constructed by building a deck over a stretch of the rail yards downtown — literally, creating 8.5 hectares (or 21 acres) of new space — we have an example south of the border to draw on: Chicago's Millennium Park. CBC News spoke to experts about that project to see what advice they have for Toronto. Their key messages: expect it to cost more than you think, expect it to take longer than you think, and go for it anyway. 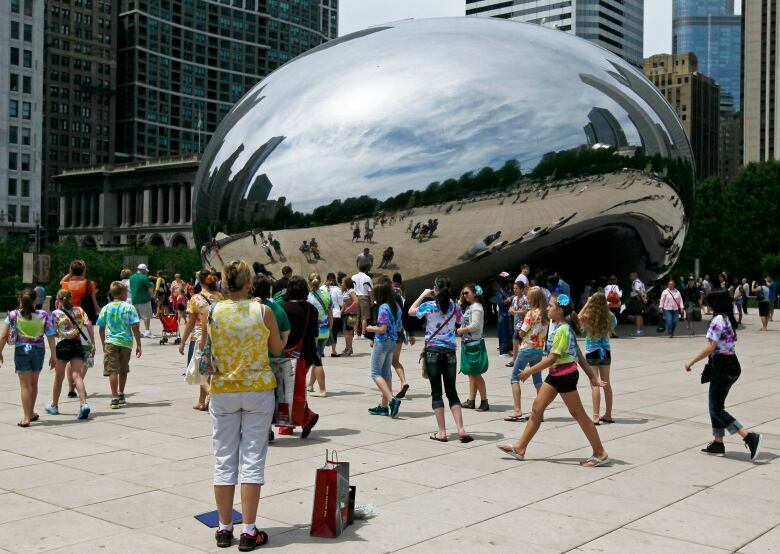 A must-do for any tourist in Chicago is taking a selfie with the famous mirrored "Bean" sculpture in Millennium Park. But what many visitors to the city don't know is that the park is built over train tracks and a parking lot. Ed Uhlir was the project design director for Millennium Park. When he first heard about the project, "I thought … I didn't want to do it." There were numerous technical challenges; work had to happen overnight and temporary platforms were required. The first estimate pegged the project at $150 million US. It came in at more than $500 million. And it was supposed to be built in a year and a half, but wound up taking more than five. "You can guess by the name … It was supposed to be ready for the year 2000," Uhlir says. But the park didn't open until 2004. Uhlir calls both initial goals for the cost and the opening date "nonsense" — wildly unrealistic given the scope of the project. And attempting to stick to those parameters would have meant the park would have been much more modest in the end, with a smaller impact on the city's life and economy. They did, however, establish expectations which later came back to haunt the park's planners. Chicago's media, Uhlir says, clobbered the project from the beginning. "They were always criticizing the project as being a project out of control, over budget." Which leads him to offer up some advice: "One tip is never release to the press a timeframe and a budget unless you`re very sure about it." In 1998 an anxious Chicago mayor fast-tracked the project — or at least attempted to. Timothy Gilfoyle is a professor at Chicago's Loyola University, and author of the book Millennium Park, Creating a Chicago Landmark. He says the attempt to speed things up was a mistake: "Fast-tracking a construction project will almost always double the cost because there are just unanticipated costs that just aren't planned for and you usually have to go back and do things over." Gilfoyle says one key to launching the project was private funding: roughly half of the money used to build Millennium Park came from individual and corporate donors. Raising that kind of private money requires a champion, says Gilfoyle. Millennium Park's was former Sara Lee Corp. CEO John Bryan. "The park was going to have rooms, you might say — where one would have a water feature, one would have a garden, one would have a skating rink, one would have an outdoor music pavilion — and [Bryan] ... went to specific families or corporations and asked them to make a major contribution for that particular amenity." As for the rising cost, Gilfoyle says much of that was due to discoveries made during the course of construction. One example: part of the park is built over a garage, and as work continued staff realized it was nearing the end of its usable life. Rather than continuing with the park and then ripping it up a few years later to repair the garage, they decided to rebuild it as part of the Millennium project. Gilfoyle says it was all money well-spent. "Developers will tell you whatever money Chicago was forced to spend on the garage or any part of the park has been more than made up by taxes generated" from the related condos and other projects that came on the heels of the park. There is also the part you can't quantify: Uhlir estimates more than 10 million people visit the park each year now. Gilfoyle has another piece of counsel for Toronto: "Think big … This is a once-in-a-generation or once-in-a-century opportunity."